Kicking off 2019 the UKCSC is moving forward from a year of building momentum of public support after the British government made a series of unforced errors, exposing their flagging strategy against progressives, as has been the case ever since the last general election in 2017. To me the Tories symbolise everything that was wrong about me before I was diagnosed with brain cancer. My defection to more progressive politics is a side effect I attribute to being forced to wise up in a very short amount of time to outsmart the biggest cancer killer of people under 40 in the UK. Had I stuck to my old anti-cannabis ways I would have been left with a 4% chance of survival and a prognosis of death by December 2017. Luckily I found the UKCSC movement. Having struggled to find an active club in 2017, I was saved by cannabis again in 2018 when I was contacted by the Bud Tank for a meet up in Wrexham. Much like a scene from Reservoir Dogs I was greeted by several lads walking in a group with shades on. They walked me to their meeting point which was a small café/bar down an alleyway I had never been down before in Wrexham. Inside there were several other guys sitting at a table as if a game of Cards Against Humanity was about to commence. I was invited to share my story. 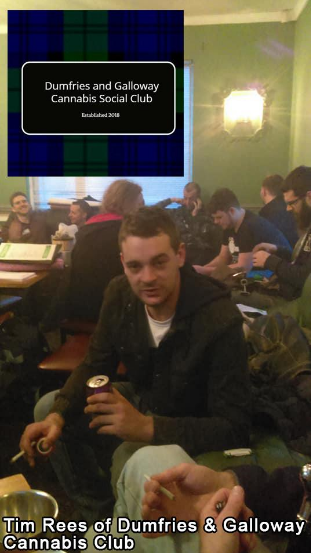 By the end of telling it which I now worry I’ve told people till they are blue in the face, there were around 15 of us in there talking about the UKCSC membership packs and what we needed to do in order to organise ourselves to become a genuine cannabis social club with a venue and events. I honestly went home that evening bursting with enthusiasm to get Wrexham on the map of cannabis clubs. After that spring meeting, which had raised my morale after the ineffective visit of the United Patients Alliance (UPA) to Parliament earlier in 2018, I joined two of the founding members on a 24-hour mission from Wrexham to Brighton’s Green Pride event and back. For us this ended up being a very useful fact finding visit to show us what we needed to get for a stall there in future. 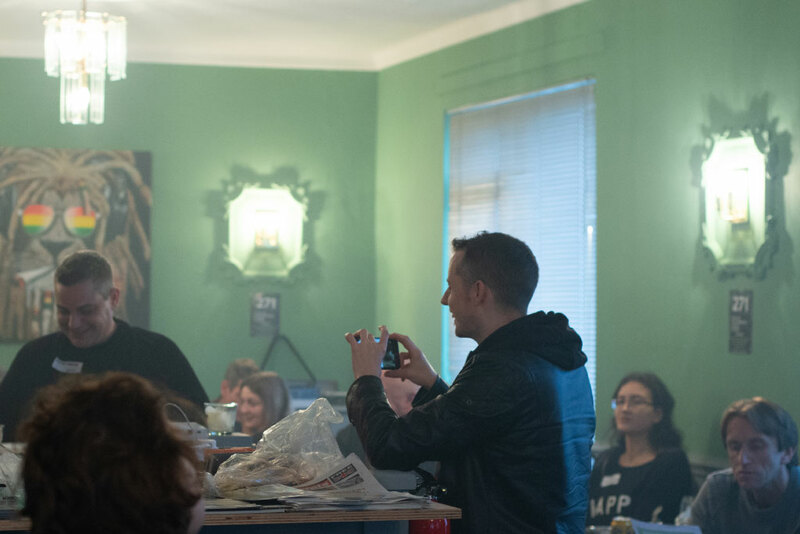 What was great to see was how many people came to be part of the event, and the weather was beautifully sunny all day, ending with an invite to Brighton’s own venue complete with vape room and a beer garden for those who didn’t have vapes. For me it was the best cannabis event I had ever been to and a beautiful realisation that the cannabis community is full of people you can easily strike up a conversation with and all the beauty that comes with a multicultural and multi-generational movement. We could tell from 420 and seeing Hyde Park filled to the brim that the people are on our side. This was evident at Green Pride as we met plenty of people who choose not to use cannabis but came along to show support for our movement. A big part of that was Brighton blessing us as the UK’s most progressive city where both the cannabis and local gay pride community support each other’s events. One of the other new clubs we met at the event and hit it off with was Dumfries and Galloway who invited me to come to their awareness event in late August. This gave me my first ever opportunity to give a real off the cuff public talk on what happened to me. When I turned up at the event greeted by one of their founders, our friend Tim Rees. 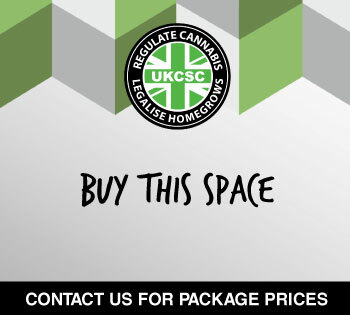 As a member of the Labour grassroots organisation Momentum I was no stranger to such a working class community venue, after spending a good chunk of the summer getting grass roots Labour support for the UKCSC with a wonderful unanimous vote to support a regulated cannabis market should Labour form a government. But this Club at Dumfries and Galloway was something else, with two floors to it and plenty of stage and hall space. Rees’s partner Sandra introduced me to give a much more in-depth talk than I had managed at Patients at Parliament. I was acutely aware that I needed to hit upon all the key points to my survival and why I now owe my life to cannabis. I was a little confused as to the fact that it felt too easy talking in front of a big crowd of people from a place I’ve never been to before because it is hands down something I would not have had the courage to do before I used cannabis. I made sure to end on the fact that although I’m happy to still be alive, I’m just one guy and we need to fight for more people to survive these rising inflammation-based diseases which look increasingly like the end result of suddenly derailing the human evolution of our endo-cannabinoid systems as a result of almost a century of corporate-driven prohibition which compared to our history with the plant going back thousands of years, is such a tiny percentage of our time on Earth but a massive change in how we maintain our health. Phil giving his speech at Dumfries and Galloway. Before I left I got to see Karen Gray who is one of the many parents of children across the UK being denied effective cannabinoid medication for their epileptic children, in Karen’s case she is fighting for Murray. This was an important speech to hang around for to me as I last suffered a seizure in March 2017 and it was the most terrifying experience I have ever gone through, so to know our government is making these children go through them made my blood boil away what there is of little Phil and his little voice. Leaving that brilliant club it felt like I was driving through an arid desert void of cannabis clubs, which got me thinking that I need to see if we can help Darwen club cover that void at some point. Unfortunately I never got to make it to their bonfire event due to looking after my first born daughter Phoebe, who like me owes her life to the UK cannabis movement as I wouldn’t have been alive to even conceive her let alone see her born if I had never used cannabis to get into remission. The rest of the year we put in a few major membership drives and building connections via the brilliant Phil Monk’s We The Undersigned community on Facebook. He was kind enough to send me some pro-cannabis information leaflets that I could distribute in my local area when I could get out. I decided to use the final week of the year lobbying shops in Chester to leave them for customers to take and was flying high after every shop including Holland & Barrett’s took a whole load of them to put on their front desks. 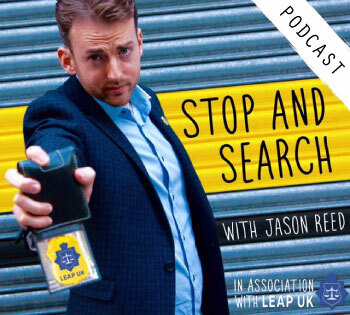 I then had a ‘what the hell’ moment, stood in front of a parked up police car and went live on Facebook to film myself preaching the contents of these leaflets and to warn Christmas shoppers that their government is lying to them about cannabis. 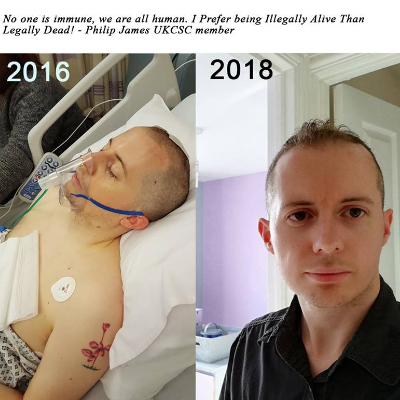 Again I didn’t feel the nerves that would have hit me in my 20s because I knew the goal of ending the war on people is far more important than my own cancer survival story. On New Year’s day I went for a walk with two of the Bud Tank founding members to talk about plans for 2019. 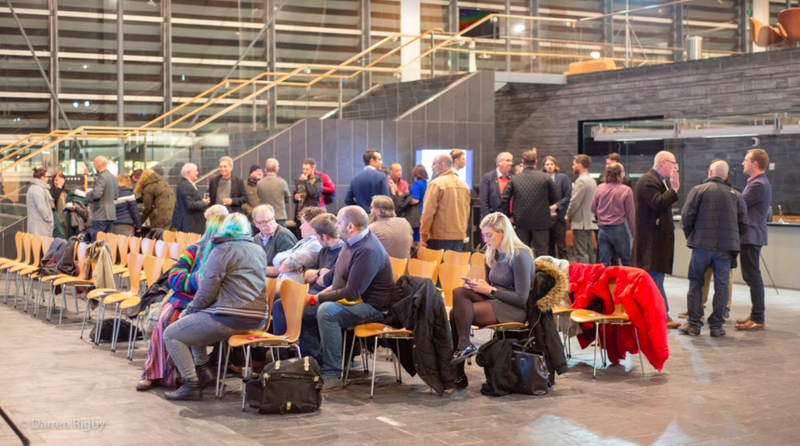 Sure enough we soon got an invite from the UKCSC to join them with WTU and other activists in Cardiff at the Welsh Assembly Senedd to meet with pro-cannabis industry politicians, academics and entrepreneurs. Suited and booted it felt like the Bud Tank guys were really in Reservoir Dogs character now. UKCSC chairman Greg greeted us with all the love you would expect from a modern progressive figurehead. UKCSC chairman Greg greets Phil and other Wrexham members at the Senned. We tried our best to make a good impression with the Plaid Cymru members that attended the event. We had the pleasure of meeting the former leader of Plaid, Leanne Wood, who started the talking with a brilliantly supportive introduction. We were also surprised to learn from her just how deep Welsh history goes with cannabis. Translating some towns and valleys as “Hemp Vale” and even one of the largest valleys as “Hemp Valley”. This was an instant inspiration for one of our founding members to make plans to hold a large event there at some point this year. 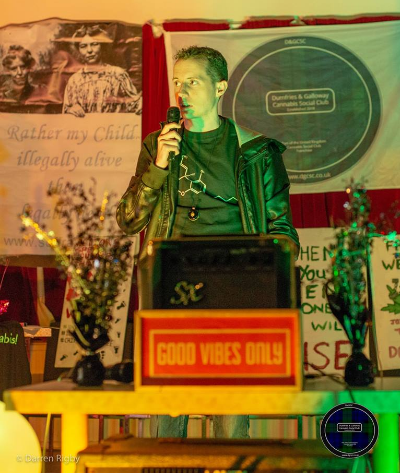 We heard from a seasoned California activist turned Welsh academic cannabis activist who had moved over to Cardiff after years of fighting for cannabis in the US to effectively manage his mental health anxiety/panic disorders. His talk we eloquent and honest and really struck a chord with me having suffered the same before cannabis blessed my life. Luckily Darren Rigby was there to film these talks. I was happy to see him there not just because I had first met him at the Dumfries and Galloway awareness event but because he was providing a record so that those that couldn’t attend due to health reasons, funds etc, could see and hear what was said at this refreshing event. 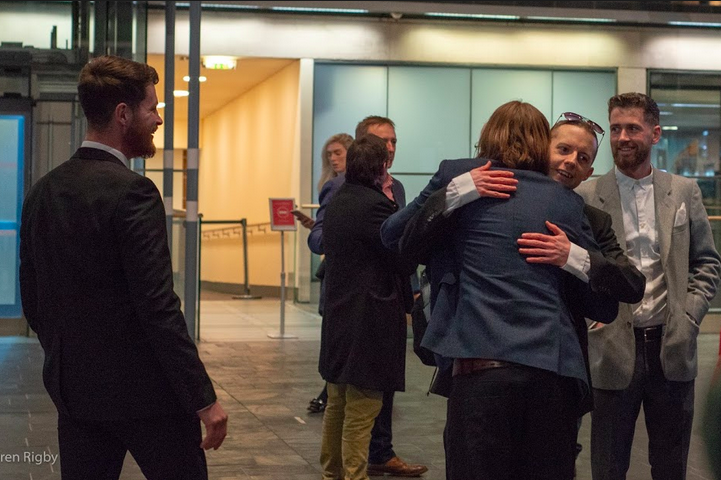 Darren Rigby captures the atmosphere at the Welsh National Assembly. When we left it was credit to our relentless Bud Tank founding member to drive us there and back within a day. We had the best deep brotherly stoner talks on the way back which made the journey fly by. 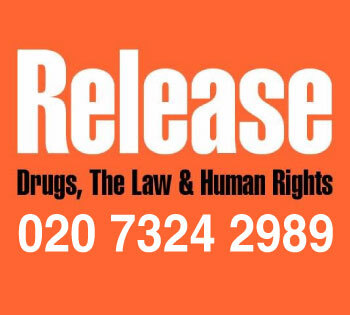 What kept us buzzing was how impressive the event was and seeing some real progressive politicians, business people and activists giving us a huge amount of inspiration on where to take our journey to end prohibition next. Before the week had even ended we were off to another event, the UKCSC AMG, this time closer to us on The Wirral. We also had one of our newer members come along this time for his brilliant attendance in 2018 and of course his dabbing expertise. 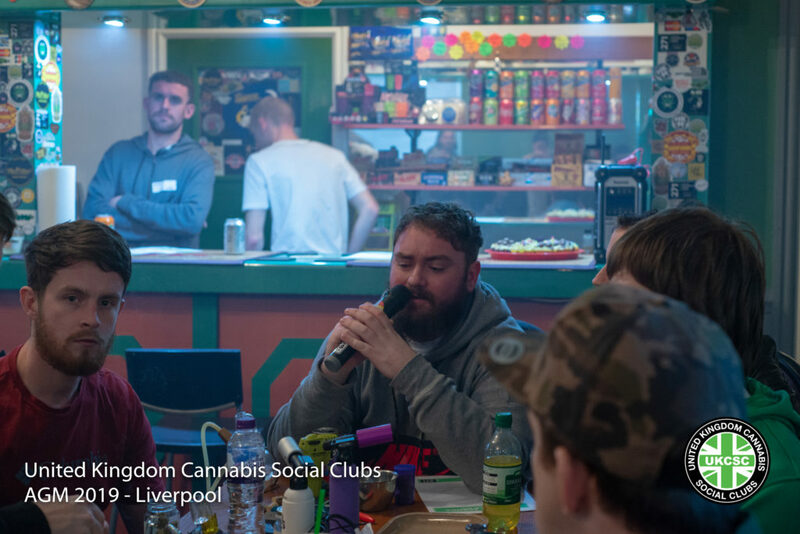 What was great about this event is that we got to meet even more cannabis social clubs from around the country, and many of those we love from Scotland came down from good old Dumfries and Galloway, but also many as far as Nottingham. Greg invited each club chairperson around the room to introduce and talk about their clubs, which gave us all an opportunity to see how far these other clubs had come over the past year. It was great to hear from some of the more established clubs like Teesside and Brighton. Stuart Harper, the Liaison and Political Affairs Officer of the UKCSC, spoke with Greg about some of the history of the UKCSC and what to expect in the coming years. In the interests of transparency, they showed us some of their overheads and were honest enough to show us just how low the income is from donations. The agenda moved onto ways we can improve our clubs, both non UKCSC and official. Something that really worked at this AMG was how newer clubs could chime in with new ideas, for example Glasgow finding ways to raise funds with legal CBD and merchandise sales. My contribution was to show my UKCSC membership card with my Labour membership card and explain that although not everyone has to have the Labour card with it, we need to be much more politically engaged as a movement. My intention was to draw attention to how by joining the Labour grassroots organisation Momentum I was able to vote to keep the Labour leadership as progressive as possible so that corporatist Labour MPs opposed to cannabis do not get leadership positions in the party anymore. This paid off recently with my vote towards Welsh first minister Mark Drakeford, who was the most progressive of the three candidates to replace the previous Welsh first minister. As a general progressive myself, I tend to agree with all the smaller left-wing parties such as Plaid and the Green party on many issues, but I am also aware after 25 years of following politics that the system of voting in our elections (first past the post) puts these smaller parties at a massive disadvantage, and that we effectively, like the US, live in a two-party system. So my goal is to encourage people to bring about change from within the most progressive party which I’m sure most in this movement would agree is Labour. The Tory Party frequently vote against cannabis related bills in much larger numbers than Labour, which is now down to a lowly nine corporatists from the Blair/Brown years. The Tory memberships also do not allow for leadership voting in the same way that Labour does. In Labour when your MP doesn’t represent what you want, you can go through your local party committee and table a vote to have them deselected, triggering an election for alternative candidates. To give context as to why I have chosen Labour as a favourite to come around to our goals, during my treatment recovery in 2016 I had a lot of time to observe the US election campaign. This made me see how lucky we are in the UK that Jeremy Corbyn is even allowed to be a leader of a major party. The progressive I was supporting in the US primaries was Bernie Sanders, who was even outspoken about supporting an end to prohibition. Due to corruption in the Democratic Party he was cheated out of the race and forced to make way for Hillary Clinton to be the candidate to face Donald Trump in the US Election. So I am very thankful that we have a membership-controlled Labour Party. Otherwise we would have someone like Liz Kendall or Chuka Umunna in charge who both have a history of speaking in favour of prohibition, whereas Corbyn literally said “we should grow up and legalise cannabis” during one of the two leadership debates he took part in. I think it’s time you got involved too, wouldn’t you say?